Do you have a chronic condition or care for someone who does? 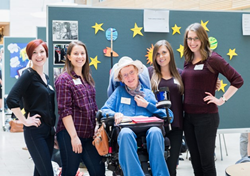 The UBC Health Mentors Program needs volunteers for September. This 16-month program puts adult mentors and/or caregivers with groups of 3-4 UBC healthcare students. Mentors meet with their group six times throughout the program to discuss health care topics and help students learn about living with a chronic condition. Health Mentors are experts in their health who want to share their healthcare experiences. Health Mentors should live in the Metro Vancouver area and be comfortable talking about their health condition. For more information and an application form visit pcpe.health.ubc.ca/healthmentors or email jen.macdonald@ubc.ca.